Danki liked to think she'd taken the road less traveled. OK, maybe she hadn't taken it on purpose exactly, and maybe the road wasn't so much "less traveled" as it was "avoided at all cost," but she preferred to think of it as an adventure. At least it would earn her the money she needed to get out of the trouble she'd found back on Earth. Especially since she had nowhere to spend it. Turning back to the crawler, she hefted another probe out of the back and carried it a short distance past the one she'd just placed. 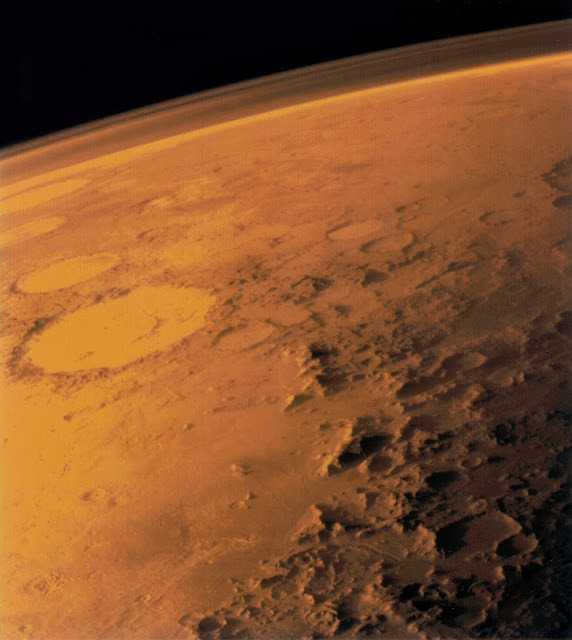 Mars had a peculiar mix of rock and sand; in theory, the probes were designed to take that mix into account. In practice, they looked exactly like the temporary fence poles she'd helped her mom pound into the ground back home on Earth. The bottom of the probes looked almost exactly like those poles, right down to the arrow head shape that held them into the ground. Of course, the arrow head was quite a bit bigger than what they'd use on Earth, but then the wind didn't fool around on Mars, either. And then there were the tendrils...but those didn't come out until she'd planted the probe. She tried not to think about the delicately flexible appendages that dug deep into the soil from the bottom of the probe. The nanotechnology that made them possible was a fair bit beyond anything she'd ever studied, and nothing she was really interested in. No matter how they worked, the idea of autonomous strands burrowing into the sand and rock was just creepy. Once the tendrils started their silently inexorable quest for hidden water, the probes were on their own. If they happened to find something, the transmitter at the top of the pole would let the outpost know about it. So far they'd found a lot of little pockets - not enough to sustain a full colony, but enough for the outpost. Two of their scientists were working on ways to store the water they found, but the extremely thin atmosphere and light gravity were complicating things. Until they figured it out, the probes were deployed in all directions looking for those tiny drips and drops the planet saw fit to gift them with. Setting probes was one of those jobs that everyone was supposed to take a turn at, but Danki had been given the task early on and she'd never been assigned to anything else. She suspected it might have something to do with the fire control incident in the greenhouse. Or maybe the emergency sewage flush she'd had to engage when things had gotten a little out of hand at the water treatment pod. It had been weeks before the showers worked properly. Most likely it was was an incident the rest of the outpost was calling, "The Great Tuna Uprising." The kitchen had been the last assignment she'd been given before the probes. She probably should have paid closer attention to how long she'd left the spicy tuna sushi on the counter while she'd prepared the seaweed and sweet potato casserole. Well, at least the new water treatment pod had been well tested by the time everyone was feeling better. The voice in her helmet startled her enough that she let go of the probe, where it slowly settled to the rocks she was standing on. At least being out of the outpost meant much lighter gravity - when she inevitably dropped something it couldn't land hard enough to actually break. "I read base," she bent to pick up the probe as she answered, struggling a little in the bulky suit. "We've got a pretty good storm kicking up just beyond your position. You need to head back." The voice was distorted beyond recognition, but the speech patterns sounded like Flen. As the lead scientist on the water reclamation project it was his job to worry, and he aced it in Danki's opinion. She set the probe in a likely looking spot and checked the ground before she replied. It had to be a fairly specific combination of sandy and rocky in order to hold the probe. Too much sand and the probe would fall over or disappear in a dust storm. Too much rock and it was impossible to get the probe in deep enough to trigger the creepy tendrils Danki was trying not to think of. "I hear you, base, I'm just setting one more probe and then I'll start back." The reply from base was lost in a burst of static. A quick glance around told her the storm was closing fast. The crawler could make it home even in the worst dust storm, but it would be slow and uncomfortable, two things Danki avoided whenever possible. She set one foot on the peg halfway up the probe and stood on it, forcing the probe several inches into the ground. It was tempting to leave it like that, but she knew they'd just send her back out after the storm if the probe fell over and they lost telemetry. When she stood on the peg again, the probe slid much farther into the ground, but then stopped with a muffled clang that warned her she might have run into a rock. She stepped back and pushed the probe back and forth to see if she could get it to shift to one side of the hidden rock. Without warning the probe slid to the left and then sank nearly all the way into the ground. If Danki had been leaning on the peg more, she'd have been thrown down. As it was, she tilted forward enough to have her stomach pitching in sympathy before she caught her balance. She stood staring at the few inches of the probe poking up from the soil. Now it was too deep; she must have hit a pocket that had collapsed when she'd leaned on the peg. Kneeling carefully in the awkward suit, she grabbed the pole in both hands and pulled carefully. When it didn't move she pulled harder, eventually yanking on it, but to no effect. The probe was stuck. "Double crap," she muttered, staring at the few inches of silver surrounded by sand. Her com unit hissed to life, and she gave serious thought to ignoring it. Unfortunately, they'd just keep hailing her, and she wasn't sure what job she'd end up with if she added insubordination to her list of faux pas. "Have you turned back to base yet, Danki?" "I'm...I'm getting ready to now, base." Or she would be, she thought, as soon as she got this stupid probe out of the hole it was in and set. She'd be damned if they'd take the cost out of her recreation rations. She grabbed the probe again and worked it back and forth, hoping to loosen it up enough to pull it out. Her focus was so complete that it took a few minutes to realize the hole she was widening was spewing tiny brilliant crystals. She cupped one hand over the hole and watched as the crystals gathered in the palm of her glove like minute diamonds. It was beautiful. Danki pushed the probe to one side and fumbled for the light at her hip, finally freeing it and shining it into the hole. Darkness swallowed the beam almost immediately, but Danki had the impression of a cavern, and movement. An aquifer of some kind? They weren't supposed to exist - something about the geology being wrong, if she remembered the science briefing she'd barely paid attention to. Realization that the crystals were still streaming from the small hole had her scrambling to the crawler for the emergency sealant. "Base, base do you read?" As she knelt at the hole again and directed the expanding foam into the hole, she listened for a response. The last of the sealant oozed out, and Danki sat back to watch the hole for the glint of crystals, holding her breath. No tell-tale diamond sparkle escaped the bright yellow plug she'd created, and she let out a sigh of relief. Her voice shook as she tried to raise base again. "Base, this is Danki. Do you read?" Still nothing but static, and it was only getting louder. If she could get the survey team out here, she'd get credit for the find. If it was even half the size she thought it might be, it would pay all her debts, her travel expenses back to Earth, and have enough left over to live and extremely comfortable lifestyle on a planet with more than sand and rocks. Danki looked back at the crawler and calculated the distance to the base in the face of the rising storm. She'd never make it before the worst of it hit, but that wasn't the biggest worry. If the storm was big enough, the probes she'd planted could easily shift. The plug she'd created would be covered, that was certain. Going back to base meant reporting the find without knowing for sure where it was. Survey teams carried gear that could pinpoint her exact location, but her crawler didn't. The mapping function would get her close, but nowhere near close enough. Once word got out, planting probes was going to get very popular. She was not going to have her discovery, her fortune snaked out from under her. Maneuvering the crawler near the plug, she hurried to get the survival pod deployed. It would send out a beacon immediately, but with the dust storm coming it would be hours before anyone could respond. By then she'd be able to make the report and claim the find.